When you need to make a break, drive to a depot or interrupt following the route for any other reason, you can Pause it. 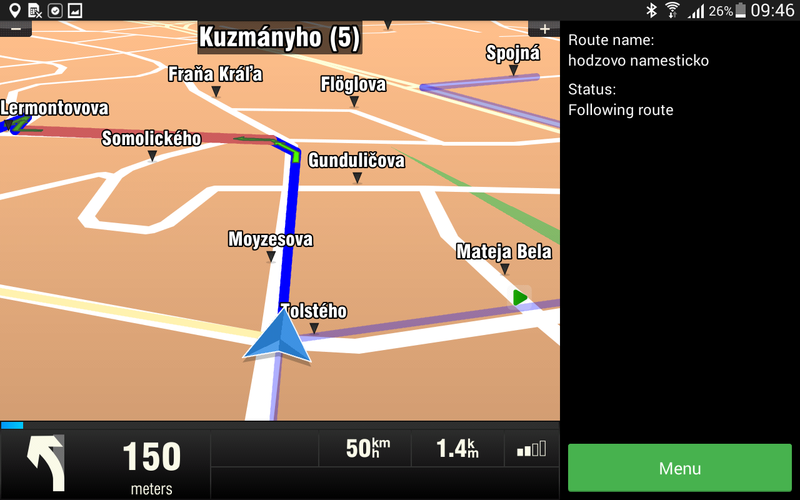 To pause the route, go to Menu and Pause. Your route will disappear, but your progress is remembered. Pause button will change to Resume button. If you wish to navigate to a proffessional location like a depot, junkyard, storehouse, base station etc. tap Navigate to button on the right. The list of professional adresses will be open. When you tap an address, you will be navigated to it. For more information, check Navigate to Address section. If you wish to navigate to a custom location, which was not synchronised with your device by a dispatcher, you can do so by entering an address. For more information, please check our Navigation manual. When you are ready to continue following the route, tap Resume button. You will be navigated to a point, where you paused the route.